UV-C light is the name for a certain spectrum of the (invisible) light. UV-C light is formed by the light in the range between 200 and 280 nm. This light is very much suitable for the so-called UV-C disinfection and is everything that is being done to terminate microorganisms with the help of UV-C energy. UV-C lamps are especially produced for these purposes. Mostly we use mercury to generate the specific UV-C radiation. The lamps are coated specifically in order to burn a minimum of 8,000 hours and retain 80% of the initial UV-C energy. After 8,000 burning hours it is recommended to replace the lamps. UV-C disinfection is applied to water, air and surfaces. Benefit of the UV-C application is that no chemicals need to be added to the air or water and the composition of the air or water does not alter. Moreover, the system is very economic compared with many other disinfecting methods. It goes without saying that UV-C disinfection is a very environmental-friendly and safe technique. UV, UVC, UV-C, Ultraviolet. They all are, sometimes incomplete, indications for the same thing; purification by means of a special element of sunlight. Sunlight contains a broad range of electromagnetic waves. The sunlight we perceive is only a part of all radiation that reaches the earth. The, to us, invisible light consists of a number of colours. But there is non-visible radiation as well. A part of this radiation is UV-C. The wavelength of the radiation is measured in nm nanometre). 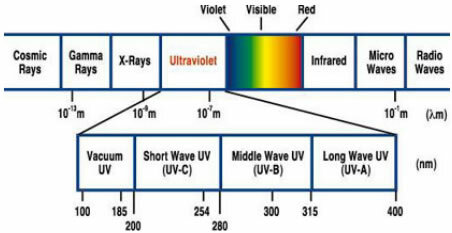 The powerful UV-C rays have a wavelength ranging between 200-280 nm. These waves are capable of destroying microorganisms, and the best result is achieved with a wavelength of exactly 253.7 nm. Since many years now this method has been applied in various sectors. The decontamination of indoor air and water by means of UV-C waves is a safe, economic and environmental-friendly alternative to other disinfection methods. The indoor air that needs treatment flows through the air purifier (the water that needs treatment flows through the UV-C room), where the UV-C lamp is positioned. This lamp is protected against direct contact with the air c.q. cold(er) water. The UV-C lamp(s) operate on a wavelength of 253.7 nm, so that an optimal result can be warranted. Thanks to the long service life of the lamps you only need to replace them once a year. The machines are available in various capacities, so that the, for you, most suitable machine can be supplied. The costs per purified m3 air / water are therefore minimal. Criteria for applying the right system are, amongst others, the maximum flowing capacity and the UV-transparency of the water c.q air. This so-called transmission can be determined by the producer using advanced equipment. A Danish physicist, Niels Ryberg Finsen (1860-1904) was the first to notice the antiseptic effects of ultraviolet and studied it. He discovered that exposure to sunlight has a stimulating effect on human tissue. His work led to the development of Finsen’s curative lamp. This lamp generated artificial sunlight and was used until the 50s of the previous century. This 'sunlight' contained ultraviolet as does real sunlight. This led to Dr. Finsen’s most important discovery. He found that ultraviolet is capable of destroying pathogenic organisms. In 1903 Dr. Finsen received the Nobel Prize for Medicine for his achievements. UV-C lamps have a limited working life. Because of the discharge of the UV-C energy tiny particles that bond to the lamp’s interior are released. This will slowly decrease the UV-C emission. After about 8,000 burning hours this process has gone so far that not enough UV-C energy is released in order to guarantee an optimal disinfection. It is often overlooked that each start of the lamp costs 6 burning hours. It is therefore recommended not to switch the lamp off and on too often. After 8,000 burning hours it is time to replace the lamp. Nowadays they can easily be ordered online, for example via our webshop www.cleanairoptima.com In your air purifier’s manual you will find directions how to safely replace the UV-C lamp.